"Those who came over were of three of the more powerful peoples of Germany: the Saxons, the Angles and the Jutes. "From the Jutes are descended the men of Kent, the Victuarri (that is to say the people who inhabit the Isle of Wight) and that people who are today called the Jutes and are located in the kingdom of the West Saxons, opposite the Isle of Wight. "From the Saxons (that is to say from that area which is now called Old Saxony) came the East Saxons, the South Saxons and the West Saxons. Next, from the Angles (that is to say from the country which is called Angulus and which is said to have remained deserted from that time to the present, between the lands of the Jutes and those of the Saxons) are descended the East Angles, the Middle Angles, the Mercians, all the race of the Northumbrians (that is to say of those peoples who live to the north of the river Humber), and the other Anglian peoples." 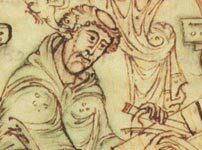 Bede's account of the arrival of the Anglo-Saxons in England (in his Historia Ecclesiastica, completed in AD 731) is largely a regurgitation of an earlier account by the British cleric, Gildas, whose De Excidio Britannia (The Ruin of Britain) was written in the early or mid-sixth century. But in one key passage, part of which is reproduced above, he diverges from his principal source and introduces us to the Jutes. Historians used to be very doubtful about Bede's account of the Jutes. He suggests, for example, that the Jutes (or Iutae) came from Jutland, which seems logical enough except that language experts insisted that the two names come from different roots. As the archaeological evidence has grown, however, it seems clear that Bede was right. The Jutes did come from Jutland. They did found the Kentish kingdom. And they did occupy and rule the Isle of Wight. Later versions of the foundation of the English nation tended to write the Jutes out of that history. But recent work by historian Barbara Yorke suggests that not only was there a Jutish kingdom on the Isle of Wight but also on the mainland opposite (an area that Bede describes as the 'land of the Jutes'). She argues that the history of the Jutes was lost as a result of their defeat and conquest by the West Saxons, but that they occupied large parts of what is now south Hampshire. Not all historians agree with everything that Barbara Yorke has to say. But Time Team's Robin Bush is convinced. At any rate, it is certain that the Jutes played a more important part in the development of early Anglo-Saxon England than had been appreciated until recently.